People often drop off donations for the council archives at my house. Usually it’s an old uniform piece or handbook, perhaps a pocketknife or handful of badges. I also have an enviable collection of random Girl Scout socks that regularly appear on my desk at the main office. But buried inside the latest two boxes of musty, mildewed paper was a real treasure. The delightful illustrations are hand-drawn with marker, and most of the draft pencil marks are still visible. I have not measured the entire scroll, but it is at least 60 feet long. The boxes came from the family of Anne Murray, who was on the National Capital Council Camp Committee in the late 1950s and early 1960s. (National Capital was one of five councils that merged to form Nation’s Capital in 1963). 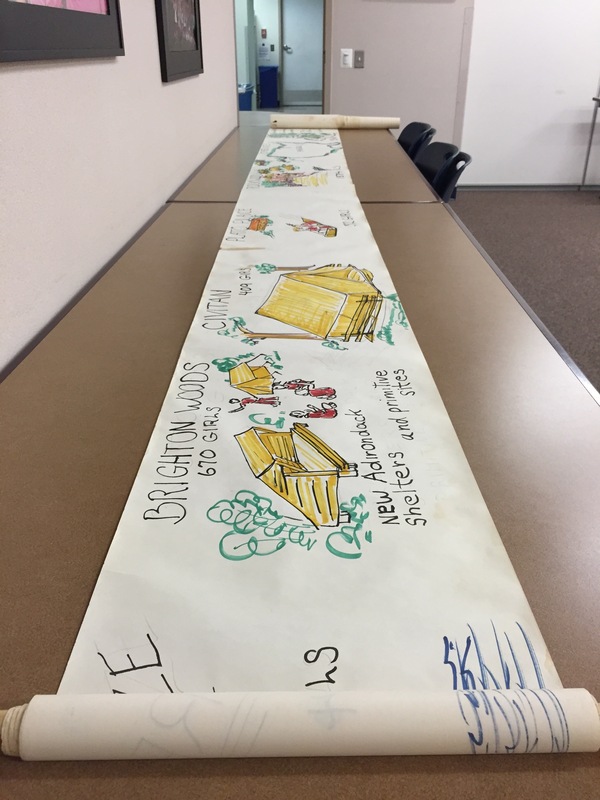 The scroll will definitely have a featured place in the new Archives & History Program Center opening this fall. Thank you Roxanne Beatty for arranging this donation!! This entry was posted in Archives, Camps, Memorabilia and tagged Bay Breeze, Brighton Woods, Camp Civitan, Camp Tuckerman, camping, Girl Scout, Girl Scout camps, Girl Scout Council of the Nation's Capital, Girl Scout history, Girl Scouting, Girl Scouts, GSCNC, GSUSA camps, Mariner Girl Scouts, Plato Place, Rockwood. Bookmark the permalink. How do you preserve something like that? although Anne seems to have done pretty well!